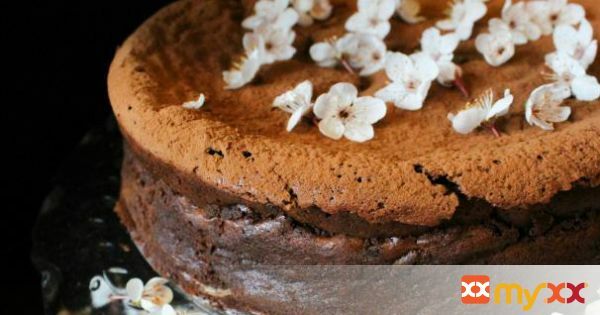 Before the petals fall to the ground, gather plum blossoms to perfume and flavor this flourless chocolate torte. Light yet decadent, this dessert is the first kiss of spring. 2. Butter the bottom and sides of a 9" spring form pan, outfitted with a round of parchment on the base. 3. Remove plum blossoms from stems. 4. In a small saucepan, combine cream, butter and plum blossoms and bring to low simmer over low to medium heat. Reduce heat and simmer very gently, stirring often for about 15-20 minutes or until the cream mixture is fragrant. Remove from heat and strain into a bowl through a fine mesh sieve. Discard spent blooms. 5. Meanwhile place the sugar, salt and eggs into a bowl and whisk (preferably with an electric mixer as this will take awhile) until the mixture is thick, pale and ribbon-y, 5-8 minutes. 6. In a double boiler over gentle heat, combine the infused cream/butter mixture and the chocolate. Stir until melted and glossy. 7. Temper the egg mixture by adding some of the chocolate. Fold the mixture together in thirds until evenly mixed, being careful not to lose too much volume. 8. Pour mixture into the prepared spring form pan. Bake for 35-40 minutes, until the top is somewhat dull and only the inner third wobbles somewhat when moved. It will NOT appear fully cooked when you remove it from the oven. It will however set upon cooling. 9. Allow to cool for about 30 minutes before gently running a thin spatula or butter knife between pan wall and torte. Carefully remove the outer ring. Continue to cool completely. 10. Lightly dust with unsweetened cocoa and garnish with plum blossoms.